Memories | Jerrie Hurd Takes Family History Seriously . . . 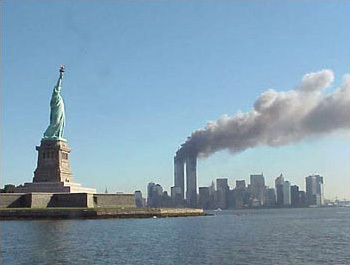 The tenth anniversary of 9/11 has come and gone. It is one of those shared moments that each of us remembers differently. I was putting on my running shoes. The television happened to be on. I called my friend and told her a plane had just hit the World Trade Center. She started to ask where we were going meet for usual 45 minutes of exercise. “Turn on your television,” I told her and for the next 45 minutes we watched together, talking on the phone the whole time. We caught the moment when the second plane hit. My husband had gone to Boston on business the Monday before. He wasn’t schedule to return until Friday. All week he kept thinking they’d get the planes flying by Friday. Saturday morning he started driving and was glad he had a car–any way to get home. Took him two days. When he went to turn in the car in Boulder, Colorado, the place was a mess, cars being turned in from everywhere, more than the local car rental place could park in their parking lot. Confusion. Frustration. My husband and I remember 9/11 as an inconvenience–an ongoing inconvenience every time we fly. There are worse stories. There are families who lost loved ones that day and families that continue to lose loved ones to the wars and aftermath of the clean-up. Events that everyone remembers are anchors in time. I’m old enough to remember the Kennedy assassination, the events of 1968, and watching the first man to walk on the moon. What are the anchor events in your life and that of your family? Are they written down? It’s sometimes the simplest things that trigger a memory. Ask Bobbi A Chukran who grew up in grapevine, Texas on fried chicken and turnip greens. She says, “My paternal grandmother was a sharecropper’s daughter. When I was growing up, so many of my stories have that Southern feel to them. Deep down, I feel lots more Southern than I do Texan, even though I was born here. My childhood was all about putting out trot-lines for catfish, not riding horses and herding cattle. Yeah, yeah, I also have a love of hens-and-chicks because they grew by my grandmothers back door. Never have liked catfish. Point is, what we share is larger than our differences. My aunt collects “life stories.” She used to work for the Daughters of the American Revolution Library—the one on the Mall in Washington D.C. The stories were too short or not considered important enough to catalog except in her closet. She has hundreds of them that average five or six pages. What does a person put down in 5-6 pages to represent a lifetime of living? The pages dwell disproportionately on little kindnesses. One woman was burned badly when she was eight years old. When she’s eighty, she describes the accident in eight words, “I tipped the tub of boiling water over.” That is followed by paragraph after paragraph about the people who helped during that “hard time.” She remembers the neighbor ladies who “turned her on her sheets.” She names those who were gentle. Dismisses the others as “not so kindly.” She goes on to describe the willow whistles that the local boys made for her that spring, so that she could “entertain herself during the long hours when she had to be still.” By contrast, her marriage gets three sentences, the birth of her children not much more attention. He was twelve years old at the time. That’s all he says about the huge unfairness of having to leave home so young and so ill prepared for life. He then goes on to talk about the family he went to work for and how they came to treat him “almost like a brother.” Years later, when the wife of that adopted family was dying, he writes, “they called me home just as they did their other children.” He almost can’t comprehend that kindness—this from a man who had come to own one of the biggest livestock businesses in Idaho. Little things matter more than most or us realize. A friend’s mother-in-law, known to everyone as “Mother Butcher,” had only one deathbed request. She wanted the family to continue to place a wreath of birthday flowers around the dinner plate of the person being honored. It was a tradition brought over from “the old country” and such a little thing, she was afraid they’d forget. There is a meme going round. If you’re tagged, you are supposed to list seven things about yourself. 1. A sister who came and stayed a whole week with our dogs while we went to a funeral. 2. The friend who shared her cottage so we had a place to stay between moves. 3. Another sister who gave me her award-winning carving. I still don’t know why. 4. The sales clerk at the hospital flower shop who asked if I had a “frequent buyer” card. I didn’t. She told me I was “lucky.” Put my husband’s surgery that day into a whole better perspective. 5. The friend who treated me to a hair and make-up makeover because I was past being mom-of-toddlers and didn’t know it. 6. The grandfather who bought me a typewriter because he believed in having the tools of one’s trade. 7. The husband who bought me a computer for the same reason when computers were priced the same as cars.